Children of Rabbi Raziel Shevach beg PM to recognize their community, remove insecurity that hangs over them. 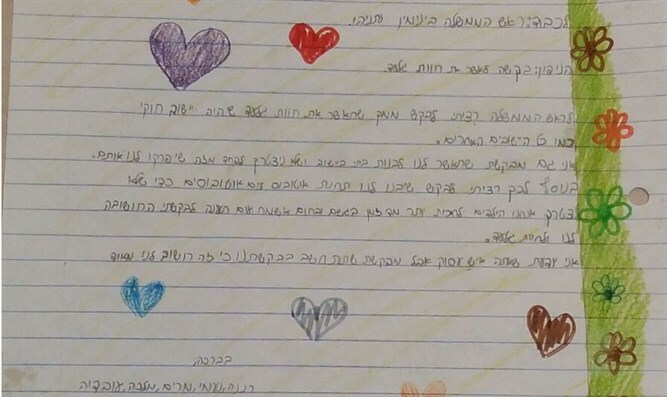 The children of Rabbi Raziel Shevach, murdered in a shooting attack two weeks ago, wrote a letter on Tuesday to Prime Minister Binyamin Netanyahu asking him to authorize Havat Gilad, the Samaria community in which they live. "I ask you to allow us to build a house in the community so that we will not have to be afraid of being expelled," wrote Renana, the eldest daughter of Rabbi Shevach, in the name of her younger brothers and sisters. She asked the prime minister "to build a bus stop so that we do not have to wait too long in the rain and the heat. I know you are a busy man but ask you to take our request into account because it is very important to us," added the bereaved daughter. The head of the Samaria Regional Council, Yossi Dagan, once again conveyed a clear message to Netanyahu: "This is the right time to approve Havat Gilad. [The move] has the support of a majority of ministers and no legal impediment." Defense Minister Avigdor Liberman (Yisrael Beyteinu) proposed retroactively recognizing Havat Gilad following the attack in which Rabbi Shevach was murdered. Prime Minister Netanyahu ordered that the community be connected to the power grid and receive electricity following the attack.